Dominic Pio Gundrum entered the world with a double diagnosis his doctor calls "exquisitely rare." 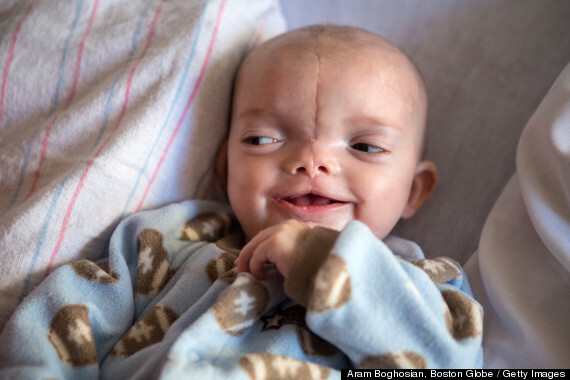 The 7-month-old boy, whose family is the subject of a recent profile in The Boston Globe, was born with an encephalocele, or brain protrusion, and a Tessier facial cleft. Both conditions were detected via sonogram before he was born. The combination is one "most craniofacial surgeons will go their entire careers without ever seeing ... outside of medical textbooks," according to a post on the Boston Children's Hospital's pediatric health blog. In a video about a similar surgery he performed several years ago -- which itself was instrumental in helping the Gundrums find their way to Boston Children's Hospital -- Dr. John Meara, who oversaw Dominic's care as the hospital's chief plastic surgeon, explains an encephalocele as "a defect in the bone of the calvarium, [which] is the bone that protects your brain." He adds: "During development what ends up happening is that part of the brain and part of the covering of the brain actually protrudes through that defect." Boston Children's Hospital's website describes Dominic's Tessier facial cleft as a "large, triangle-shaped gap running from his upper lip through the middle of his nose and forehead." Doctors at the hospital advised Dominic's parents, Mary and Mark Gundrum, before he was born; five months after his birth, at the beginning of December, they "perform[ed] a seven-hour operation to remove the encephalocele, close the skull, repair the Tessier cleft, and bring the baby’s facial features together," the Globe reports. The Gundrums and their eight children moved out to Boston for the intensive surgery, staying in a house another family had generously donated for their use. After the procedure and three weeks in the ICU, during which he suffered conditions including fungal meningitis, Dominic is now recovering at home in Wisconsin. 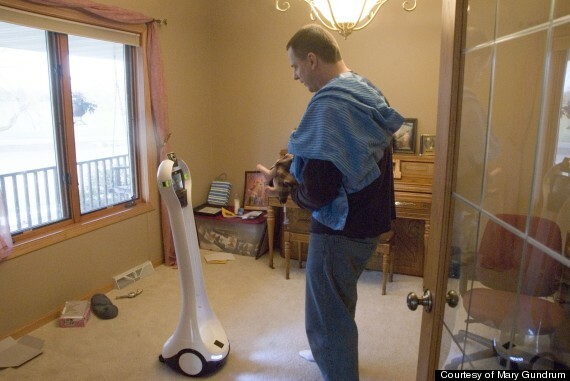 Although he is no longer on the East Coast, the baby is still under Dr. Meara's care; since he can't provide that care in person, Dr. Meara watches over his patient using a VGo robot. In an interview, Mary Gundrum told HuffPost the family has only set the robot up once so far, but plans to use it more going forward. "The doctor's able to control it from where he is in Boston," she said, explaining that Dr. Meara can move it around the Gundrums' house in order to "circle around Dominic." "At one point we had some bumps or pustules on his incision site that I wasn't sure of. And I wanted to ask him about it. So instead of us just trying to describe what things look like, [the doctor] can actually see it himself; he can zoom in, take still photos -- he can do everything but touch Dominic." As for Dominic's recovery so far, Gundrum said: "I'm very pleased with it -- I think we all are. We're still weaning him off of the narcotic, which is probably the most difficult part, but he's almost finished with that, and the more we weaned him, the more we got our son back, so that's very hopeful. And as far as him being stable ... They can't find a pituitary gland on him, which is kind of amazing because he was producing normal hormone levels before he came in. After the surgery, they were kind of out of whack in certain areas, and since then he just continues to stabilize in each of those areas, so that's encouraging." Dr. Meara told The Boston Globe that Dominic is "developmentally ... appropriate for his age," and Mary told the newspaper she's been told he won't suffer brain damage, but "will probably be legally blind." "He's very happy to be home -- that's obvious -- and we're happy to have him," she told HuffPost. "We will have one more surgery for cleft palate repair, but that's a lot more straightforward -- it's one of the most common daytime surgeries. So I'm not overly concerned with that. But other than that, he's staying out of the hospital and we plan to keep it that way." For more on Dominic's diagnosis, surgery and recovery, click over to The Boston Globe. 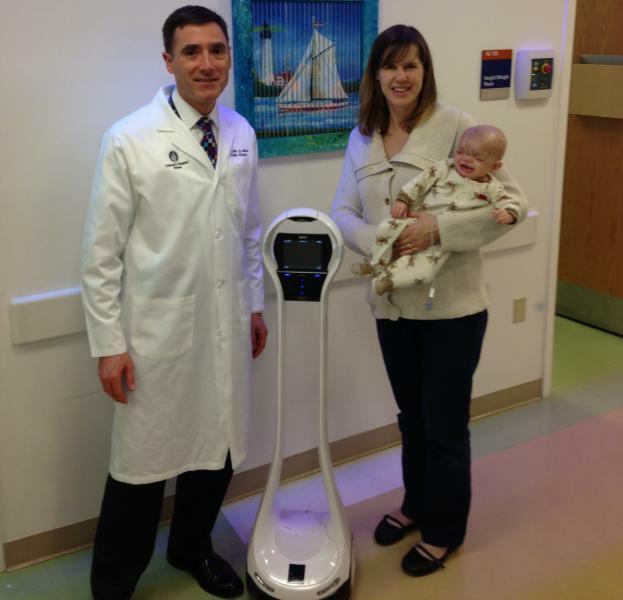 While Dominic is the youngest patient ever to be observed with VGo, this is not the first time that Children's Hospital Boston has used the robot to monitor paitents. In an ongoing study, Dr. Heip Nguyen and the Urology Department have been using the robot to observe post-surgery patients in their homes. 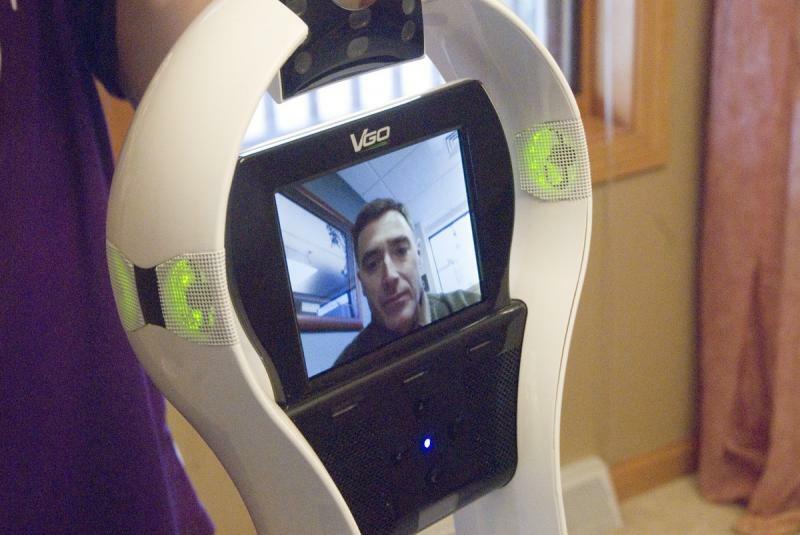 The VGo can help save costly readmissions, but Dr. Ngugen has often said that one of the greatest benefits is that VGo has helped his patients be more involved in their own health - a surprising and pleasant discovery. Click here to read the article in Healthcare IT News from September.